It's the Prime of Life: My Best Age Really Is Now! Life's possibilities during this time are endless if we embrace the truth of midlife and all it has to offer us. Traveling this midlife journey by discussing my newest book, Your Best Age is Now, I have been struck by how many people are inclined to highlight the negative aspects of this stage of life: one's 40s, 50s, and 60s. I definitely saw this during the first week of my book tour. 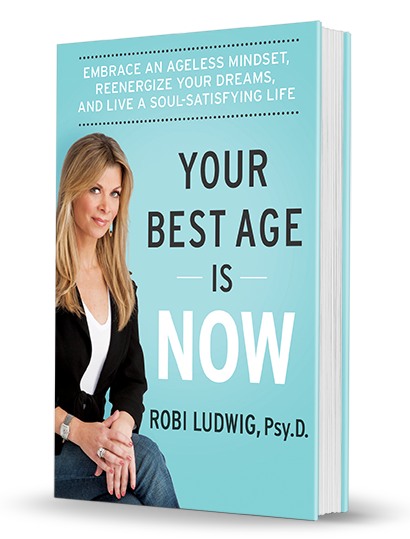 During this launch week of the book, one of the first comments I heard was that in spite of the increased wrinkles and changes to our bodies, Dr. Ludwig suggests that midlife can be the most fantastic time of our lives. I'm paraphrasing here, but you get the idea. My thought was Your Best Age is Now is definitely a new perspective on this beautiful time of life and recognizes many misconceptions that have sadly pronounced the end of your looks, the end of your youth, the end of your job and the end of relationships; none of which is true. Needless to say, I don't subscribe to this dismal view of midlife, but I certainly had moments where I questioned how my midlife status fit into society's scheme of things. I was asked to reveal my age once during a television job interview. I did share my age, but remember thinking, "Will age be a negative?" I finally decided to refuse to give into these thoughts and return to the balanced thinking that age is merely a number, not a descriptor of one's ability and personality assets. So, I began doing what I do whenever I am curious, I researched the middle years. Now this research led me down a very enlightening path. Many of the books I read did address midlife and loss: loss of looks, loss of being noticed, loss of a women's menstrual cycle. The only gain mentioned was the gaining of weight, not the type of gain I was looking.These books felt more like books about grieving than celebrating a really important time of our lives. As I read this literature, I was simultaneously studying the midlife women around me. They were fit, fabulous and totally engaged in life. They didn't look like they were experiencing or expecting any kind of decline anytime soon. The patients I treated in midlife were also making great strides in their lives. I started to rethink some of these ideas we'd been socialized to believe about turning 45 and beyond. Maybe there was some new information out there that could fix this discrepancy of what I had read and what I was seeing. Fortunately, my instincts proved correct. Science has made some new observations that has proven much more promising for people entering midlife. It turns out midlife is not only a time of certain losses, as it was so often portrayed, but it is also a time when many positive gains take place. We are still making new brain cells. Our personalities continue to develop and change in the most encouraging of ways. We become more pleasant, accommodating and better able to problem solve than when we were younger. We also know ourselves better and become more intuitively plugged in to those around us, which makes our personal world more rewarding. After making this discovery, it became my mission to share this encouraging information. Due to the advances of medical science and combined sociological realities, it's taking us all a little bit longer to grow up; thus, midlife has become a distinctly new phase of life. One ripe with possibilities to explore all of our new found knowledge and strengths. One of the biggest obstacles we tend to struggle with is this internalized and outdated expiration date that mid-lifers face, because of the way midlife has been described in the past. Although we may be moving in the right direction, we still have some biases and challenges to overcome regarding this time of life. Have we been through this kind of transition before? It turns out we have: adolescence. New studies show there are many similarities between adolescence and midlife. The fountain of youth may be as easy as tapping into our adolescent self and energy. During adolescence, our bodies are changing, our hormones are fluctuating, and it's a time to separate from our parents and become our own person. Similar challenges take place during midlife. So much so, that Gail Sheehy referred to this time of life as "Middlescence." 1) To say yes to life and adopt a "you only live once attitude attitude." 2) Turn to good friends for support and comfort. 3) Dismiss attitudes and ideas that don't serve who you want to be, and start with the misconceptions once held about midlife. 4) Validate yourself and listen to your soul or inner voice. 5) Use mentors (older and younger) as a way to inspire and help you to transform, grow and stay current. When you talk to women in midlife, they often feel more confident, and younger than ever before. Many feel they're in better shape, too. Gloria Steinem said during a recent talk that she tells anyone who'll listen what her age is, which is 82, because she can't believe it. Then she went on to say, "The mid 50s and beyond are so undervalued. It's a time of freedom and fun." So, the truth is finally coming out. Age is simply a number and some numbers have been more maligned than others. It's now up to us to show the new studies of midlife beauty to those around us. It is time to embrace this enriching time of life by enjoying all that it has to offer, and to engage in a Your Best Age is Now mindset. Life's possibilities during this time are endless if we embrace the truth of midlife and all it has to offer us.